This paper assesses the impact of political institutions: central government vis a vis local governments, in the territorial allocation of central government’s transfers. The effect of political forces in the transfers system is analysed in the setting of a resource rich economy. Using data from local public finances in Ecuador, this research illustrates the political variables that interact with normative concerns, underlying intergovernmental relations. And although recent policies shifted towards an equitable territorial development agenda, path dependent and/or discretional behaviour have prolonged territorial differential access to central government resources. Furthermore, fiscal dependence on oil revenues makes the Ecuadorian case a significant laboratory to examine how the political economy of intergovernmental finances is related with the occurrence of natural resource revenues. It uses quantitative methods, Generalized Method of Moments (GMM) and Fixed Effects Model (FEM) to study the determinants of transfers’ distribution. The results support the assumption that political institutions affected the intergovernmental distribution of transfers, increasing the territorial disparities in the access to central government resources. Moreover, this study has uncovered several important factors that are associated with the occurrence of resource surpluses. First, resource surpluses weaken political and fiscal restraints. Second, it provides evidence of the fiscal vulnerability to oil revenues, and therefore, it raises distress about the sustainability of public spending in Ecuador. 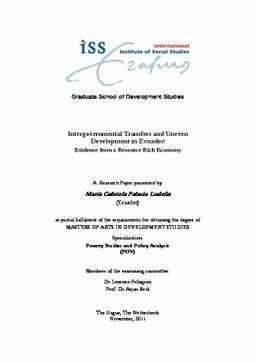 Relevance to Development Studies Distributional considerations are at the heart of the state-led development paradigm. However, the degree at which the government coherently channels its efforts to redistribute resources across the national territory relies on institutional arrangements, and it is responsive to territorial structures. For that reason, this research attempts to shed light on how the state interacts with local actors, observing territorial distributive features.